This morning (4th June 2018) a brand new national digital radio station launched called Hits Radio - the only national commercial radio station to be broadcast out of Manchester, from the regions to the rest of the UK. The station is now the headquarters of the renamed Hits Radio Network (formerly the Bauer City Network) and is available nationwide via DAB digital radio, online and via apps. Manchester’s Key 103 station is now a localised version of Hits Radio and will be called Hits Radio Manchester. 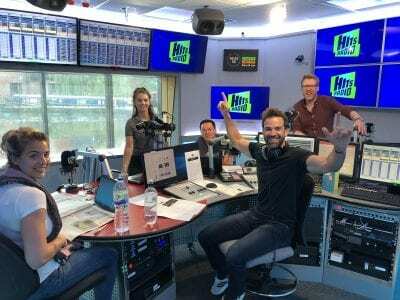 The stations breakfast show will be hosted by Gethin Jones, Gemma Atkinson and Dave “Comedy Dave” Vitty, Mike Toolan will present the mid-morning show, afternoons will be hosted by Debbie Mac, drive will be hosted by Wes Butters and evenings will be hosted by Sarah-Jane Crawford. The new station from Bauer Media is targeting 25-44-year-olds and will air chart hits from the likes of Ed Sheeran, Dua Lipa, Little Mix, Coldplay and Ariana Grande. On the stations first show, Hits Radio Breakfast with Gethin Jones, Gemma Atkinson and Dave Vitty were joined by Jess Glynne and the station’s first track was voted for by the listeners – Take That’s Greatest Day, aptly chosen to celebrate one of Manchester‘s favourite bands.